Kelsey Regan has always had a love for the environment and adventure. As a former runner, Regan trained with Iowa State’s track and field and cross-country teams her first year of college. She left the team when she became injured and realized she wouldn’t continue running much longer. Looking for a new adventure, she took up long-distance biking and started with 100- and 200-mile races. She finished her first 200-mile race in 12.5 hours and began to wonder how much more she could do. Her next challenge? A continuous ride across the state of Iowa. Regan biked 280.7 miles from Council Bluffs to Muscatine in 19 hours and 24 minutes to set the Iowa cross-state record on May 30. “When I found out that no woman had ever done it before, I felt it was something I was meant to do,” Regan said. 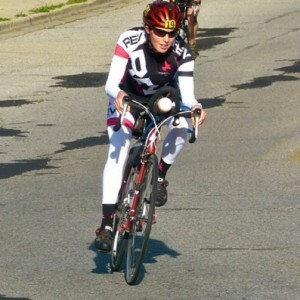 She spent about two years training for the record-setting ride, during which she battled through headwinds and hills. Even through all that, she stayed strong and kept going with the support of friends and family cheering her on. That kind of perseverance keeps her focused on reaching her goals, not only in biking but in engineering as well. The Davenport, Iowa, native became interested in engineering when she was in high school and found a way to combine the two with agricultural and biosystems engineering. Regan’s research focuses on solving problems with fertilizer and excess nutrient loss from fields, which causes water pollution. She began working in that area during her undergrad studies at Iowa State and decided to continue it while she pursues her master’s degree. Her research group is working to develop best management practices for farmers, meaning they try to find ways to keep nutrients in the fields where they can help crops grow instead of ending up in the water where they can cause pollution. Currently, a large percent of farmers apply an unmeasured amount of manure nutrients to their fields, and when too much is used the excess washes into the water streams and when not enough is applied, the farmers lose money because they have lower crop yields. “We found out that if farmers test their manure for nutrient content, they have a better idea of how much is being applied to the field instead of just guessing and letting the extra go to waste,” Regan explained. The nutrient pollution is harmful to aquatic life—it is even a contributor to the “dead zone” in the Gulf Coast. Regan’s research will hopefully create more efficient methods of field nutrient application for both the environment and the economy, because it will also help farmers save money. Regan hopes to continue her work in the soil and water area after graduation. She also has goals for her ultra cycling, saying she’d like to ride across every state.